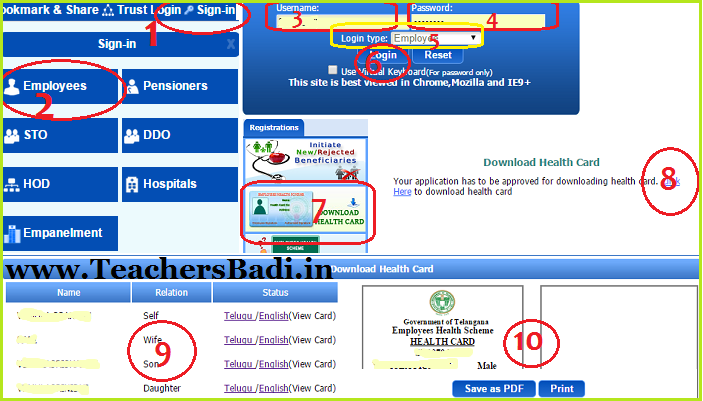 Download Permanent Health Cards, How to Download Health Cards, Telangana EHS Webportal, TEHS official website, Telangana Employees Health Scheme Cards,Unlimited Cashless Health Cards, Aided Teachers Health Cards, Employees Health Cards, Teachers health Cards. Telangana Employees Health Scheme: Employees Health Scheme is intended to provide cashless treatment to all the State Government employees including the State Government pensioners, along with their dependent family members through a network of empanelled hospitals of Aarogyasri Health Care Trust." Health cards has been issued long time back but not accepting in any hospitals.